Does Bully Max Work? Bully Max Side Effects and other things you should know. Bully Max is a product that is designed to gain muscle mass on your dogs. It is especially beneficial to dogs that you have for show purposes. Just like humans, a muscle building supplement alone will not get you results. You will need to exercise and eat right along with these supplements. Your dog should be fed a varied diet containing mostly meat. Now you do not have to put your dog a strictly meat only diet, you can feed them a quality kibble like Wilderness by Blue Buffalo. Blue wilderness is a grain free kibble that is protein rich. From my personal experience, I can safely say Bully Max works! but it is not that simple as adding this to your dog’s diet. You must setup a good diet for your dog as well as follow the recommended Bully Max dosage, read on to find out more. such as broccoli to provide a varied diet. My American Pit Bull Terrier loves to eat boiled broccoli, different dogs may like different veggies but try them all. A lot of dogs like carrots as well in their diet. After their daily diet, you can give them the chewable Bully max tablets to snack on. I haven’t noted any sign of Bully max side effects with any of my dogs. However, I have closely followed the recommended dosage below. For sick, pregnant canine over ten pounds give two tablets daily. When buying the Bully max supplement, be sure to at least get the 180 capsules for $57. The reason being, muscle building isn’t done overnight. It will take some time for the results to develop. You would be wasting money on the 2 months supply. You can purchase the available Bully Max supplies on Amazon. Once your dog is up there with their results you can either cut back or keep them on the raw diet I mentioned above. Bully Max is a product worth buying because it does provide results. You can see the video results of a Pit Bull on Bully max below and see for yourself. These results were taken within 30 days of the supplement and it is nowhere close to its maximum potential. 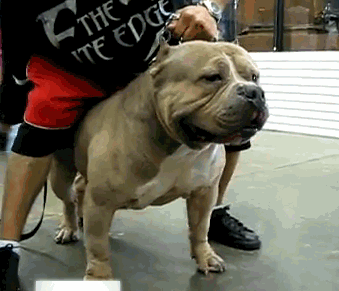 This dog is an American Pit Bull Terrier with the bloodlines of Razor’s Edge and Camelot bloodline. The Camelot blood line gives the dog its height. 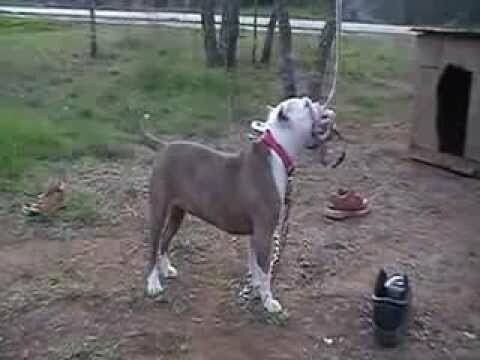 This is a female Pit Bull Terrier in the video so you will not see her get as big as male would. I haven’t noted any Bully Max side effects with my dogs, they are happy and vibrant as ever. Many online reviews are saying how great Bully Max worked for them and from personally trying this product, I can say myself it works! However my results are based on the raw diet described in this article, follow it and you should get the same results or better. Does Bully Max Work for Pit Bulls? wat happens if u take ur dog off bull max after a year or two or three…once u start them on it do u have to keep them on it for there life….??? Although you don’t loose muscle you may loose size unless you can compensate for it with raw feeding or other protein sources. I got a 2 years pitbull , Can give this supplement to my dog as well ? Yes your 2 year old dog will benefit from it, they are not considered adults till 3 years of age. Congratulations on your new pup! I’ve never seen one in person! Yes you may give her Bully Max, also the best raw meat diet would be 1/2 pound a day, 85% meat and 15% veggies. Veggies dogs like may include yams, carrots etc. Introduce raw diets slowly. Freeze raw meats for 3 days to avoid your salmonella worries, though they will be fine. Victor Dog Food is based in TX. My dogs love it. I use the purple professional bag. 40 lbs of food for 35 bucks and u feed em less. So it does last longer. Less poop and more nutrients. They do have grain free versions too but I m happy w the professional formula. Pitty breeders use the food…just google Victor dog food and pitbull and you will see. No I’m not a spammer I got 2 min pins, and tibetan mastiff and an american Bully. Just on Victor and exercise they are lean now just to buff em out a lil bit …checking to see if Bully Max makes the difference after they are already healthy. you should wait till 6 or 7 months to start feeding raw as their digestive system is still maturing and all dogs may not handle it well this early. 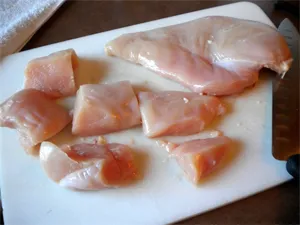 After that you can introduce cut up chicken breast to their dog food and as they grow slowly introduce legs etc uncooked with bones. I used to feed mine purina smartblend up until this age and up to a year without any issues, smartblend is cost effective as well. I have an American Bully 12 weeks old I what is the best raw meat and how do I prepare it for him? Also he’s on Nutro Max now so how do I make the transition to raw foods? Your dog in the video has an ear infection. Constant head shaking is the usual sign especially with the cropped ears. Just a heads up. I have a pit that just turned a year old and recently got a boxer puppy and he’s 3 months old…my questions are can I give my boxer this product and is there any dog foods that I could give both of them instead of going with the raw diet route? Yes the Purina SmartBlend chicken formula works great with my Pit Bull ever since she was a puppy. It should work for Boxers as well, some Boxers however are very picky on dog foods and they can have allergy problems with certain foods. Try a small bag with them first. I would wait till your puppy is at least 8 months old to start on the bully max product. You want them to grow at their ideal rate till then to avoid any bone problems. Ok now I feed both my dogs pure balance rice and chicken blend…do you think that would work as well? The food looks fine as I don’t see any corn and wheat, but keep an eye on the boxer puppy, any hair loss issues especially around the neck can be caused by a gluten allergy. I have a american pit and i had her on diamond for about 3 weeks at age 7 weeks. She started having stimach problems so i changed her over to ideal balance puppy food. It was good but she wouldnt eat it after 2 months or so but she did add 10 to 12 lbs in the 2 months. I have had her on blue buffalo for 3 months now and been great. Steadily gaining good weight and looking good. I have a 5 month old pitbull ive been thinking about getting him bully max but have been hearing that it may be bad for his joints at this time since he’s still a growing pup. What do you think? 5 months is too early I would wait till he is at least 8 months. Thanks for visiting my blog, be sure to like us on face book! You can give 1- 2 tablets daily with food. Also be sure to keep her hydrated. Hi Manrreet, I know that Ebay India sells Bully Max. Just Google “Bully Max Ebay India” Good Luck and thanks for visiting! Giving my 12 week razor edge puppy Bullymax vitamins and Blue Buffalo dog food for large breed puppies. Is this a sure-fire combination for results? I am not a fan of the Blue Buffalo dog food but I suggest Purina SmartBlend with great success. I feed mine Purina along with raw meats occasionally and she prefers raw over the dog food. Together you should see some great results. Good luck to you. Be sure to post pictures of your dog on our Canine Facebook Group. Hi..I have a 7 month old Neapolitan Mastiff and i have seen the ads of BULLY MAX.So is it ok to give my pup this product?If yes,then will it work? And what wud be the dosage? Bullymax will work for your dog but wait till your Mastiff is at least 1 year old and his or her bones are fully developed. You don’t want to speed up the growth of a Mastiff especially since they are prone to skeletal problems such as Hip Dysplasia. Follow the dosage that is recommended on the bottle. Thanx…Can u tell me in how many days will i be able to see a significant change in my dog?? And unlike pit bull,neapolitan mastiff have loose skin and a fatty build up…so what kind of change will take place in him? Usually results are achieved after 60 days of using this supplement. Your dog will be big but because of its loose skin genetic disposition, the results won’t be as noticeable as it would be on a Pit Bull. Thanx….I am going to change the present dog food to Farmina Natural & Delicious chicken and pomegranate,which i heard and checked is one of the best dog food in the world.Is it(for a neo mastif)?somewhere i heard,a neo mastiff needs low protien and high fat diet,that why i choose this food…Is it true? A low protein diet is suggested for growing puppies because again you don’t want them to grow too fast which takes a toll on their bones. However, you can lower the amount you feed to control this problem. Orijen is a great dog food, I also recommend Purina Smartblend. Always choose a dog food that has no gluten. Also if your dog tolerates raw meats, give it to him once a week. You can also give him other home-made items such as baked whole pumpkins with no added sugar. If the dog is more than 40 pounds, should I double dosage? Hi Samuel, 2 tablets daily should be sufficient. More than 2 doesn’t cause any adverse reaction to your dog but 2 tablets should be all that they require. Yes, I heard about the 6 feet of snow in Buffalo recently, must be tough out there. You have your dog on an excellent diet already. The Bully Max would definitely help him bring out more muscle tone. I would give him a low dosage per day as a supplement, 1 tablet or half a tablet is enough. Good luck. It seems like a tight market for Bully Max in India however be sure to try Alibaba and Bullymax (.in). Please let me know if it works for you thanks. How is royal canin for rottweilers? I’ve had success with Royal Canin with my Boxer dogs, My Boxer used to have severe acne from other foods so I chose the gluten free Royal Canin brand. I can’t speak for Rottweilers but I’ve never had any problems with their dog food. Please let me know if it works for you. Hi, I’m getting my dream Pup in next few days. His bloodline is very good and involves various Pedigree. His fathers’ side is Neo Mastiff + Cane Corso” and Mothers side is Dogo Argentino + Great Dane. I want to include Bully Max in the diet schedule. The Pup will be 8 weeks @ the time of delivery. Please advise me a schedule to start Bully Max. Further please let me know any other supplements that I can use. Our routine is very much outdoor. Lot of running and Hiking. Hi congratulations on your new puppy! I would wait till at least 6-8 months to get him started with Bully Max as too much protein at early stages in life can cause bones to grow too fast which is not good for a large breed dog such as yours. Avoid buying from the bullymax (.ca) site. I have a 4 month old Staffordshire Bull Terrier. As most dog lovers I want only the best for him and would never do anything or give him anything that would hurt him. I am having him professionally trained eventually moving into personal protection. Am it safe giving him Bully Max? I just want he absolute very best for him. i have a 7 months Rottweiler i feed him dry food so i bought bully max but still didn’t start giving him, is it good for him?, and what should i feed him with it. i have a male French Bulldog at 4-months old. He is more than 10-lbs. Very hypher and active puppy. He is in Raw Meat Feeding + Calcium and Fish Oil Supplements. Can I give him Bully Max? Thank you. I would wait till he is at least 8 months old as he is already getting enough protein. Dogs develop better bone structure when they grow at a normal rate. Vinu, Why are you telling these people that they chouldn’t give their pups Bully Max until they’re 7-8 months? Bully Max is safe for puppies as young as 7 weeks. After 12 weeks, it’s safe to have them progress to Gorilla Max. If you look at the ingredients in Bully Max, you’ll see that it doesn’t contain anything that a human can’t take. It’s a multi-vitamin for dogs. This information is taken straight from the Bully Max website. Vitamin C, Glucosamine/Chondroitin are all good for joints. Fish oil is good for heart health and coat. If you want your puppy/dog to gain weight, try Dyne Trophy and give your puppy Ultra 24 milk replacement until 12 weeks. As far as a good dry food, I wouldn’t give my a Purina product if they gave it to me. Look at the ratings and reviews on Puppy Chow and Purina One Blend. Horrible! A good dry food that used by several Pitbull and Bully breeders is Taste of the Wild. They have several different formulas and one will suit your puppy/dog fine. Miguel I am glad it worked for you but not all dogs are made the same especially large breeds. Pit Bull’s however are resilient dogs, medium size and is an exception to this rule. I know dogs such as Cane Corso’s and other large mastiffs need their time to grow. They shouldn’t be fed these supplements prior to 7 months of age, their bones will need to be matured slowly. You don’t want them growing rapidly which can lead to problems like hip dysplasia at a later age. I have a 5 month old Bully female and I give her Bully Max once a day and she loves it! I do a puree of broccoli, carrots and a little brown rice and mix it with Taste of the Wild Prarie formula for puppies. I add some ground chicken and beef to the mixture and she knocks out 2 bowls per day. I take her out for a 2.5 mile walk through the park and she jumps up on 12 benches throughout the park as we go. The next day we just walk the 2.5 miles and the third day we do 10X50 yard sprints and walk one mile. She’s going to be a beast and I’ve known about this breed for over 40 years. I’ll keep you guys updated. 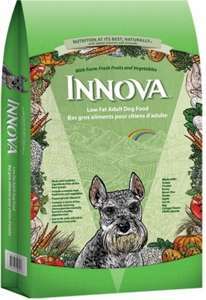 Follow up question, my 5-month old male French Bulldog is on raw food diet since 1st month: chicken, liver, beef, pork and some entrail + multi vitamins with enough exercise (fetch running). I want to make him lean and I’m planning to give him Bully Max to his diet. I don’t want him to get fat. Is it really ok give give him that supplement? Thank you sir. It’s OK for you to give it to him/her. I started my pit on Bully Max when she was 5 months old. It’s just an excellent multivitamin. Nothing to be scared of. Noted. Thank you sir for the information. God bless. I have a male american staffordshire and he is 5 months now im aware that i should wait till at least 8 months but as far as feeding i feed them once i get home from work at 6am and again at 6pm. Now do i feed him just the raw meats and veggies mixed for both feeding periods. Or do i put raw meat, and veggies in with a little bit of dog food? And as far as the bully max go do i give him one after each meal or during the meal? For muscle building it is better to feed them multiple times in small amounts if possible. I know that is not realistic with most of us working all the time. You can give the capsule with the meal or right after the meal, I prefer to give it right after the meal. You can feed them either way depends on how your dog likes it. My dog will just eat the meat and leave the veggies there :). If your dog is picky, you can mash veggies up and put it in with dog food as a separate meal. My dog is neutered will the product still work for him? Hi Nick, neutering your dog doesn’t interfere with the effectiveness of this product. thanks. I have an 8 month old saint Bernard. His hind legs have a lot of muscle loss & they are skinny. Will bullymax help in developing muscle mass for him? Hello, i have a 9 month old female french mastiff. I just started giving her the gorilla max powder 2xs a day along with her dry Nutro Large breed food mixed with wet can food. Her stool is really soft, no longer in turd form (sorry…) I am giving her the recommended amount of gorilla max per meal. Is this normal? She does have a sensitive stomach. Please advise. Also, how can i keep flies from biting her ears? She stays outside during the day, weather permitting, and the flies attack her ears. I get them cleaned once a week, but they still sit on the top of her ears and bite them. I have a male Argentino Dogo pup, 7 months old 70 lbs. I have him on a mix of blue buffalo and science diet. I’m curious to know what bully max would do for him if used for a 6 month cycle. I won’t be doing raw meet feeding, I already do that with my F1 male savannah and can’t afford it with my pup. I have a 6 month old bully that weighs 30lbs. I only feed him one a day. Do I give him half a cup of powder for his serving? 6 months and 30 lbs? Sure Grove and raw ground beef. Yes. He’s a solid pocket Pitt. Thank you for your help!!! Sure Gro 100 is a much better product. Cheaper and works better. I have a Lab Dalmatian Border Collie mix how will bully max effect him since he’s not pit bull? How would u recommend starting dosage on a boxer that’s weights 65 pounds and is in puppy stage still and ounce he up to his weight limit I like how should I keep him up without doing the pills ??? I have a 9 month old Catahoula, he is 75lbs already and growing well but I want to get him bulkier before I let him actually go out and help me hunt hogs. I’ve been keeping him on dry beniful dog food so far. Do I have to feed him the raw beef and vegetable diet, or can I add a little beef to his dry food? Will the bully max still be as effective with that diet? Hi Kraapy, you can keep him on the same diet and add raw beef to his dray food. This is what I do as well, I haven’t fed my dog completely raw as there are some vitamins and minerals that you can only get from the dry kibble. You should also try switching him to a better brand like this one Purina Pro Plan which I also feed. I have a 2 yr old pug. Would I be able to use this product for him? Hi Mary, this product should be safe for your pug. Hi I have a pitbull puppy it has 10 weeks and I would like to know that I can use bully max for my dog to be big and have muscles and which dog food do u recommend for me to feed it. I have german rotts, and for some reason mine won’t eat raw food. they will eat some veggies though. I may try bullymax and see where it takes them. Can i give bully max to my bloodhound, she’s 4 months and also my rottweiler, he’s 7 months?? I would wait till your blood hound is at least 6 months to feed Bully Max, your rotti is good to go. Hi Rhonda, your dog should be fine as Bullymax doesn’t have any side effects. The high protein content will only hurt the dog if it is consumed for extended periods of time in large quantities. Be sure to give him plenty of water to flush it out of his system. I ordered bully max a week ago and still waiting. I have a 13 month old APBTB. His last show the judge said his loin needs more work. I added swimming and upped the distance on his drag. His next show is 6 weeks away. Do you think he will be ready for this show if I received my order this week? Hi Colleen, 6 weeks is cutting short but I think you may be able to put it off. Good luck, let us know how it went! would love to see some pics of him, feel free to upload it to our forums section or fb group @ canineowners. Is bullymax suitable for Golden retriever puppies ? They are two months old and so skinny ? Had a question have a 6 years old American Bully Pit can she be able to take bully max at that age but does have a big built body just wanna tone it to more muscular will it be good for her or to late to even begin!? I wake up this morning to know all all the medicine has been chewed by the dogs @ a time …. What are the effect I will see on the dogs… Hope they are not going to die. I just got a full bred blue nose pitbull. She’s about 10 weeks now. Dogs on Bully Max do they get mad and attack if they don’t get this food or does it make them act out as a side effect. Hello please I have a 1year old female Caucasian shepherd can I introduce her to bully max, and what happens if one should stop giving his/her dog bully max supplement after a while. I was wondering if I purchased this, would I be able to give it to Remington the lazy pitbull? Would it help him? Hi. I’ve got a Staffordshire bull terrier is it safe to give him bully max? no problem and yes it should be safe for all dogs. I have a 3 year old red nose male and 7 month old blue female I feed them raw beef mixed in with their kibble food daily I just order gorilla max what should I be doing to see the best results ? What happens if your puppy accidentally eats an entire bottle of bully max while being away at work. I have a French bulldog she is about 5 months like to know what type of meat diet to put her on with bully Max? you can give her used to raw frozen chicken legs, backs etc. i would start with chicken first then move on to pork, beef etc. i usually thaw it a bit by running warm water over it but not too much, it doesn’t bother them.